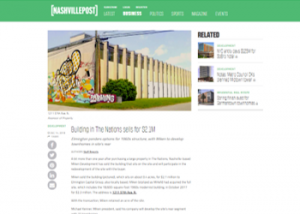 A bit more than one year after purchasing a large property in The Nations, Nashville-based Miken Development has sold the building that sits on the site and will participate in the redevelopment of the site with the buyer. Miken sold the building (pictured), which sits on about 0.4 acres, for $2.1 million to Elmington Capital Group, also locally based. Miken (stylized as MiKeN) had acquired the full site, which includes the 18,600-square-foot 1960s modernist building, in October 2017 for $2.3 million. The address is 1211 57th Ave. N.